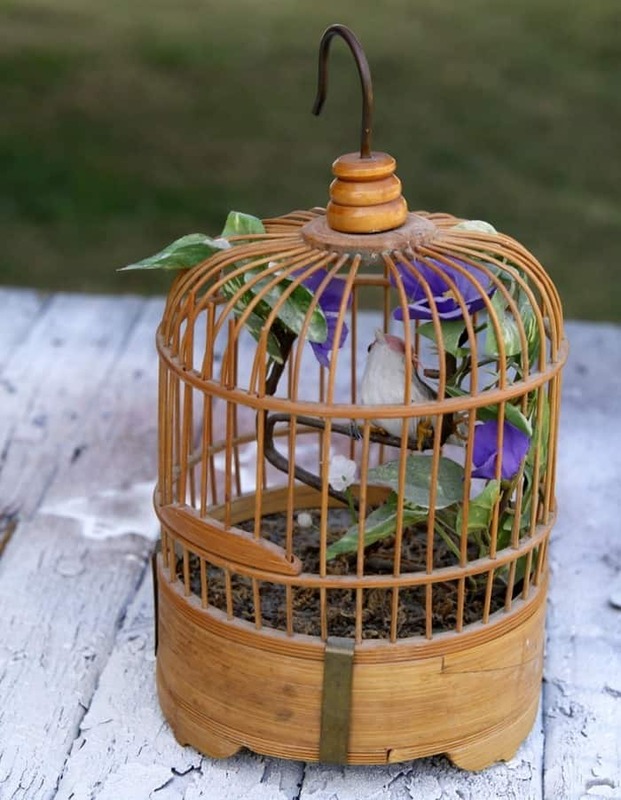 I found a small decorative wood bird cage at the thrift store for .99¢ (deal). I’ll show you how I took everything out of it and then filled it with a pretty winter snow scene. Wait until you see it. Winter Wonderland…. See. I told you. What a pretty little display. Brings a smile to my face. Certainly is a lot lighter than the original look. 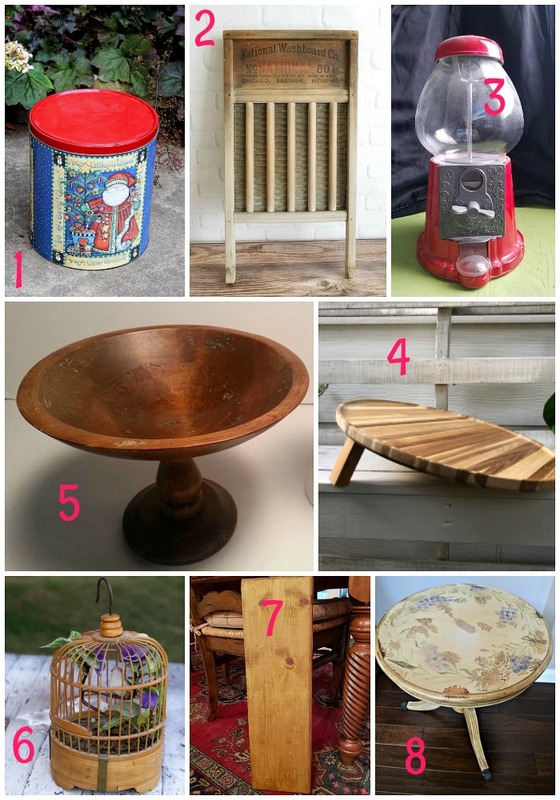 Today is Thrift Store Décor Day and my thrifty friends have some really fun makeovers today. The links are at the end of this post. 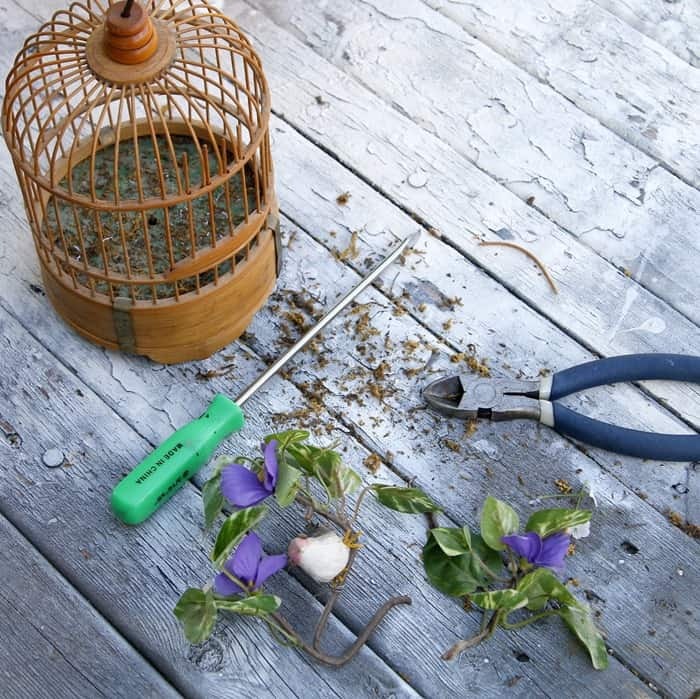 The bird cage wasn’t so pretty to start with. It was a music box, I think. There are batteries and some kind of gadget on the bottom side. Come to think of it I didn’t even install new batteries to see if it worked. Will have to do that when I get back home (in Arkansas for a week). I might have a musical rotating winter scene and don’t even know it. Despite the faded details inside the cage I thought the wood and small metal details on the base were pretty. 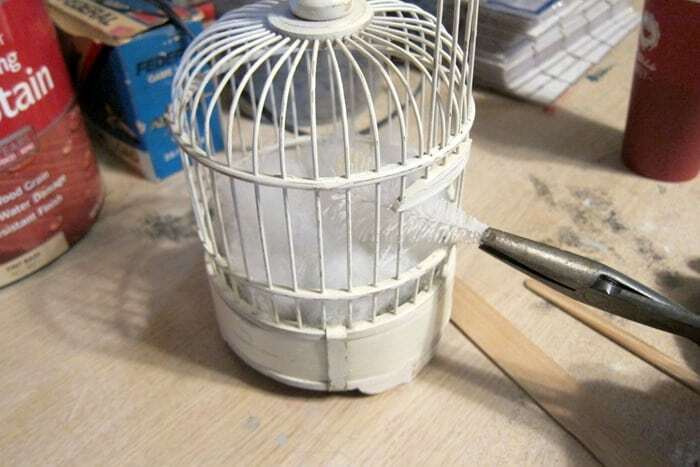 I took a pair of wire cutters and screwdriver and removed everything I could from the inside of the cage. I had to use the tiny opening in the side to remove everything. It was a bit touch and go but I finally got all the junk out. 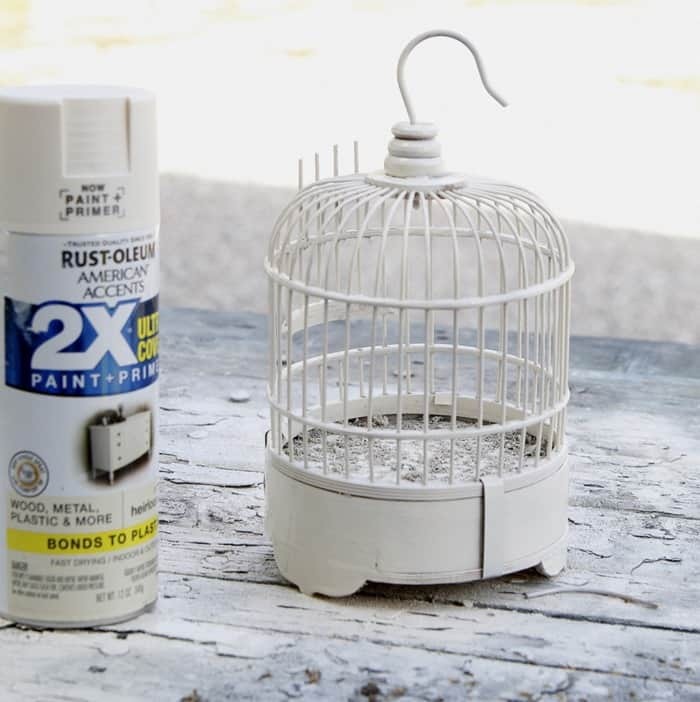 Next I used my favorite Rustoleum Spray Paint, Heirloom Satin, to give the cage a clean fresh look. You guys know it only takes minutes and a can of spray paint to turn a thrifty find into a thing of beauty. Just a tad of distressing on the metal and the wood. 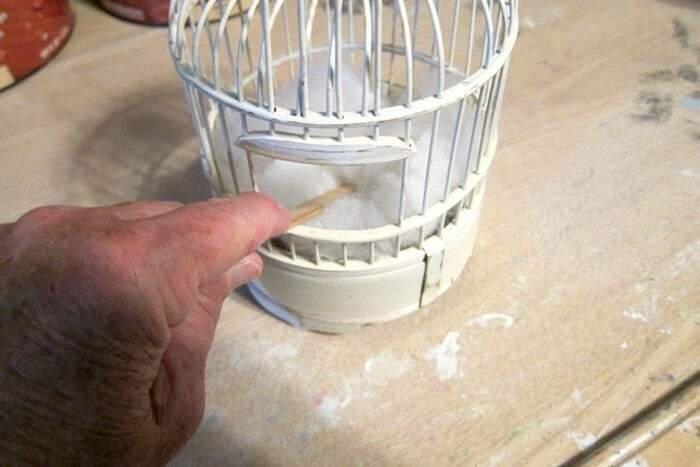 I didn’t use any glue but just stuffed the white bird cage with fluffy stuff I bought at the craft store. It has tiny little silver stars and glitter in the fluff. I used a popsicle stick to push the fluff into place. 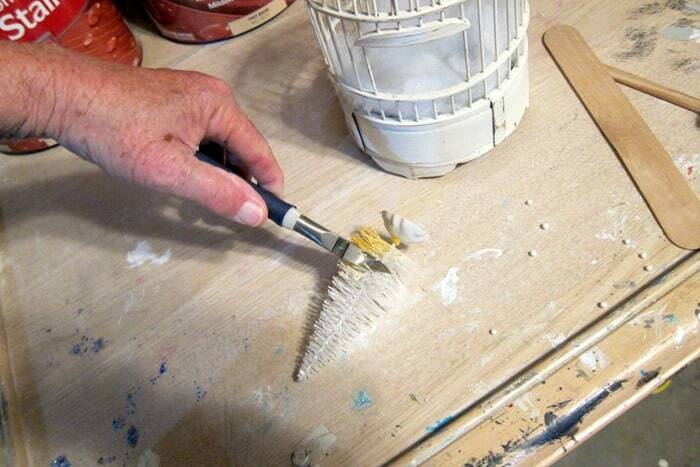 Popsicle sticks are handy little DIY tools. I also use them when working with hot glue. Saves my fingertips. 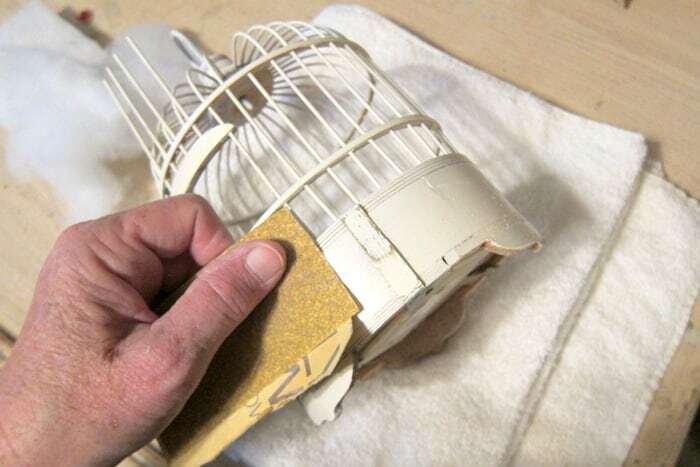 The only issue I had was trying to find things to put in the bird cage. I had tiny, tiny, snowmen from past projects but they were too small. Next I tried ornaments but they were too big. I went through my stash of small decorative Christmas trees and decided they were all too tall. No problem. I got out my wire cutters and chopped off the bottoms. To place the trees in the cage I used a pair of pliers and went in through the cage door opening. Nothing is glued down. Once I put the trees into the fluff they were stuck. Not going anywhere except maybe to lean a little. I just stuck the popsicle stick in between the cage bars and pushed the trees upright. I put three trees in the snow scene. Remember, when decorating you should go with odd numbers. 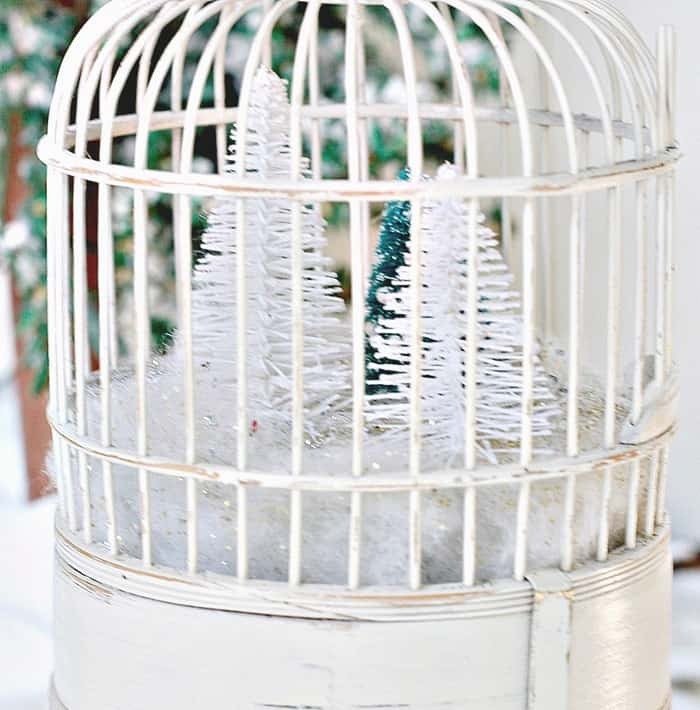 The silver trees didn’t make it into the cage because they were just way too big. 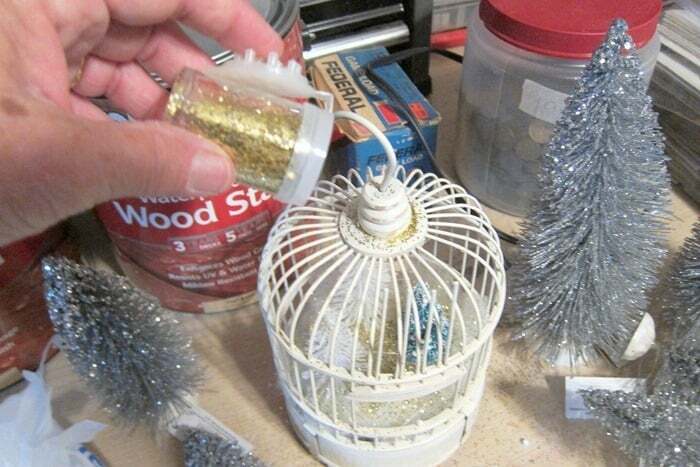 I noticed all of the glitter falling off of the silver trees and decided glitter would be the finishing touch for the bird cage winter snow scene. I just happened to have a container of gold glitter on the shelf (very top shelf away from little hands). Thank goodness there was a bit left from the time Sofi and friend decided to glitter up the workshop, shed, carport, backyard, and papaw’s boots. No more glitter for them. If you have a glitter explosion story feel free to share it in the comments. Just a note on all the little white and silver glitter trees. I found them on sale at the end of last Christmas season and the receipt was still in the bag. The trees were between .18¢ and .25¢ each. Another good deal. Turned out pretty sweet didn’t it. Start with a vision and find a way to make it work. No, it’s not perfect. perfectly imperfect. Glitter and sparkle and distressed paint……what’s not to love. Can’t wait for Sofi to see it. I bet she will find a special place for the bird cage. Probably in her room here at the house. 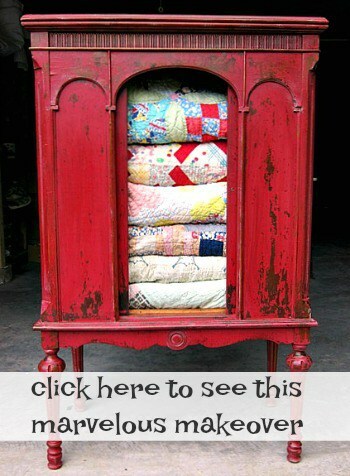 Thrift store decor makeovers are one of my favorite DIY’s. Spray paint is one of my favorite DIY products. It’s an easy and inexpensive way to update used decor. 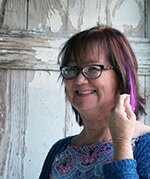 You can find my favorite spray paint and diy products on the Petticoat Junktion Amazon Page here. Time to visit my friends. Just click the links below the “before” makeovers photo collage. I just LOVE this. Firstly, what a fabulous find for your hard earned $0.99! And now it looks super cute and shabby-fancy! 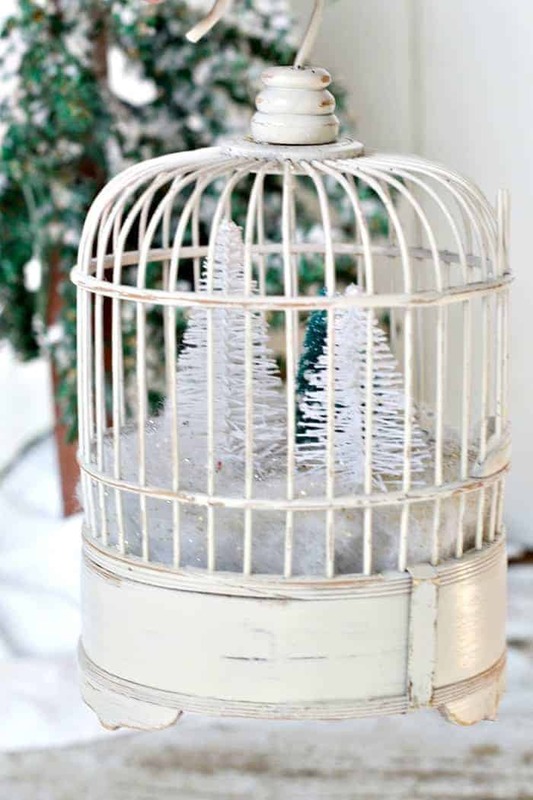 This is the cutest cage and it’s perfect for Christmas!!! So cute!!! I love your winterland! What a wonderful find!! I have a passion for birdcages and this one turned out fantastic. Thank you for the information – it’s something I’ve been lacking lately. 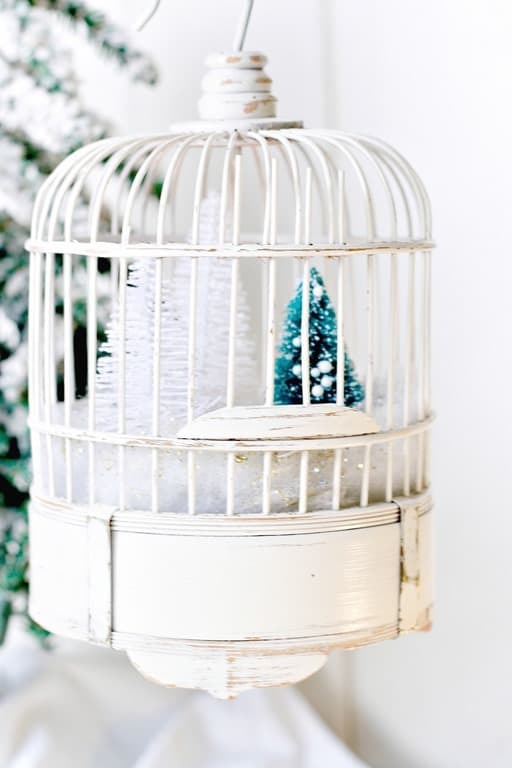 Super cute project and perfect for the holidays! What a perfect new look Kathy! It’s awesome that you didn’t have to glue anything down permanently. The seasonal changes are now endless! Sophia is going to love it for sure! 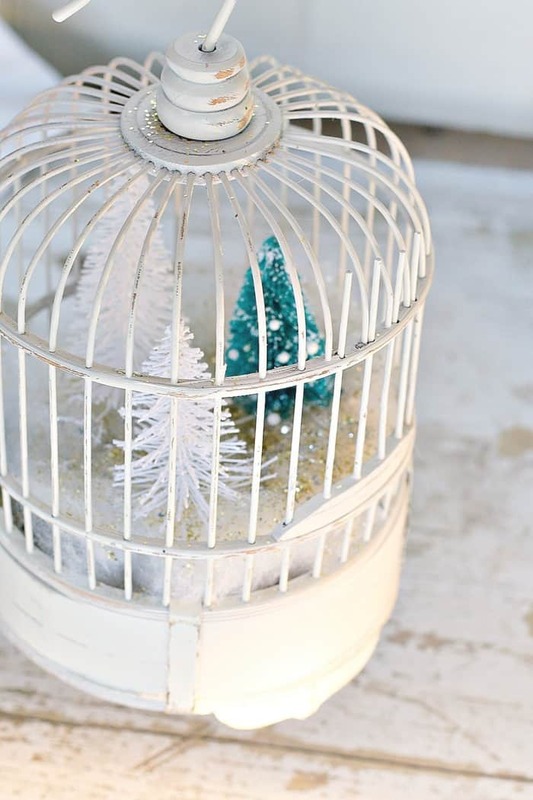 I love bird cages and this is a cute holiday alternative ! That turned out VERY CUTE! I’m dying to know if it rotates now. I like the way you have a number of items in your home that you re-purpose as it were on a seasonal basis. This one seems like a prime candidate. So much better than having multiples of things you can switch to suit the occasion in this way and very inventive.